Representatives from the United States and Thailand combined efforts and cut down a 3,200-acre opium plantation in Chiang Rai on Friday. 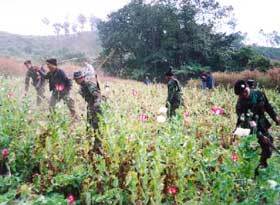 Reports say local villagers planted the opium plants in exchange for pay. The plantation area is hard to access by land because it lies in a valley.